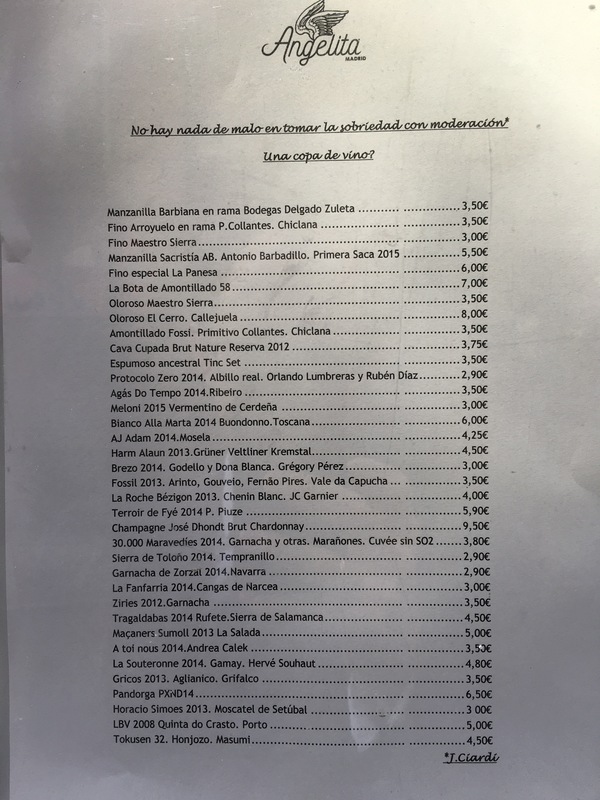 Behold the quite magnificent list of wines by the glass on offer in Angelita Madrid – the brilliant new restaurant, wine bar and american bar at Calle Reina 4. It is the new project of the Villalon brothers – a great couple of guys who are seriously knowledgeable about all things alcoholic (if you think the winelist is impressive, you should see the hard liquor these guys have). We took advantage and had glasses of Arroyuelo en Rama (which was brilliant – from September 2015), Panesa, Villapanes and 2014 Pandorga, and we also had a quite sensational bottle of nine year old Do Ferreiro Cepas Velhas – which seemed young and just got better and better, and an even more amazing 40 year old Barbaresco which was smooth but structured and full of spice. There is no doubt that it is a serious destination for wine – there were a lot of familiar faces and we were fortunate enough to bump into one of Spain’s great new winemakers – and the food was cracking too. I couldn’t fault anything that we had, from sweetbreads to dessert, although the the octopus on a puree of cauliflower was exceptionally tasty. We didn’t get around to making use of the american bar facilities this time but the sofas look dangerous and it will surely not be long before we come back and close the place. Cracking wine, good food, great people, all adds up to good times. (June 6 update: Wanted to post to this magnificent article/interview of David Villalon by Jose Carlos Capel in el Pais – in which David gives a magnificent example of what these guys are all about (in Spanish)).